Liverpool went seven points clear at the top of the English Premier League (EPL) after a penalty kick gave them a 1-0 win at Brighton & Hove Albion on Saturday. The penalty kick was scored by Mohamed Salah and the victory ensured that Liverpool bounced back from two successive defeats in all competitions. The result put the log leaders on 57 points from 22 games, seven ahead of closest rivals Manchester City who are at home to Wolverhampton Wanderers on Monday. Third-placed Tottenham Hotspur, who have 48 points, can cut the lead to six points as they host Manchester United on Sunday. Liverpool produced a clinical, even if unimpressive, performance on the south coast. They lost 1-2 at Manchester City in their previous league outing before being beaten by Wolves in the FA Cup third round by the same scoreline. After a dour first half, Salah produced a moment of trademark individual skill to win the penalty kick he converted five minutes into the second half. It happened after Pascal Gross fouled him following the Egyptian’s neat footwork in the penalty area. Xherdan Shaqiri, who got a rare start on the right flank in a reshuffled 4-2-3-1 formation, missed Liverpool’s best chance in the opening half. He headed inches wide after Trent Alexander-Arnold’s cross. 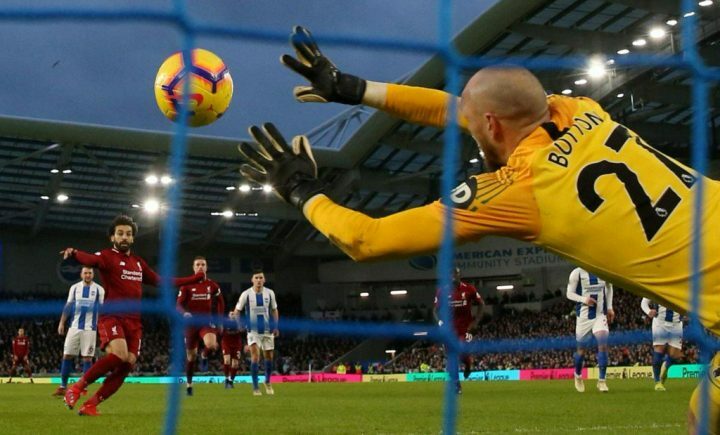 As Brighton threw men forward in the closing stages, Liverpool twice came close to scoring again late on with the home team’s goalkeeper David Button parrying Roberto Firmino’s effort.